Specifically designed for reheating on airplanes. Our oven-safe cooking bags allow the food to brown through the film which can therefore stay in place throughout the cooking period - so preserving both flavor and juices. There is less weight loss so you get more servings, less need for added fats and, of course, a clean oven. For the microwave, our oven-safe cooking bags are ideal; they present no barrier to the microwaves and can be used for microwave cooking in direct contact with the food. 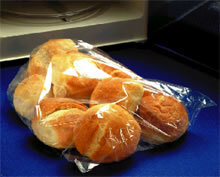 In the freezer, our oven-safe vacuum bags stay clean and flexible down to -20°C. They will not stick to meat or to other packages, which enables dishes to be transferred easily from oven to freezer and from freezer to microwave. 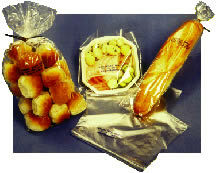 We are the world's leading producer of oven-safe cooking bags for in-flight catering. We are pleased to supply many of the world's leading airlines and in-flight caterers. Also for airline use, check out our Air Sickness Bags. For food-grade emergency preparedness supplies, please visit our Water Storage section.